About a month ago when we had that week or two of summer weather, I decided it was time to break in the homebrew equipment that has been living with us, unused and neglected, for the past year. The warm sunshine called for a Hefeweizen, and I picked up a pre-measured kit from Oak Barrel Winecraft in Berkeley (the store didn’t impress me much, btw). It came with a choice of several different types of yeast, and I went for the Hefeweizen ale yeast #IV, which is supposed to have notes of clove with minimal banana. 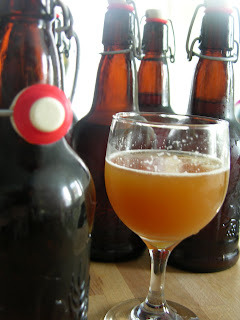 Now I’m not going to go through all the nitty gritty details of this particular experience, but I would like to dispense a few words of wisdom for the first-time homebrewer, on the off chance you were planning to pop your brew cherry this weekend. 1. A copy of the The New Complete Joy of Home Brewing is a great resource. It’s even more helpful if you’ve read through it beforehand. 2. Turns out the hydrometer is important after all. 3. Make friends with bleach. 4. Brew with someone who’s done it before—it might be more helpful than that book you didn’t read. It’s more fun too. 5. Sometimes bottles explode. It’s an indication that not everything went quite as planned. 6. As my homebrew buddy Lisa says, “It takes beer to make beer.” You know what to do. The mistake: I forgot about the beer and left it to ferment in the carboy a week longer than directed. Turns out this may not have mattered too much because the temperature in the pantry was colder than I thought, and it looks as though the process didn’t eat up enough of the sugar. This is my theory on the exploding, super carbonated brews. The result: a cloudy beer that tastes nothing like a Hefeweizen, but is still pretty darn tasty—kind of reminiscent of a strong Belgian ale and worthy of a weekend cookout. No local homebrew supply store? 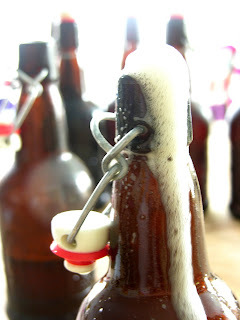 Here’s good place to get started: Midwest Homebrewing and Winemaking supplies. 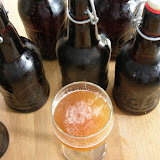 Check out the rest of my homebrew adventure photos here.